← What’s a “Super Tuscan”? 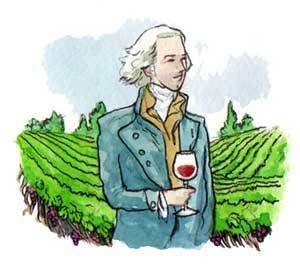 Did you know that Thomas Jefferson, founding father and third president of America, was an avid wine connoisseur? During his first term as president he spent $25,000 (or the equivalent of $75,000 today) of his income on importing wine from Europe! He actually spent 50 years (and went deep into a financial debt he never managed to get out of) on his quest to find a way to make good wine in America, a feat which no one had been able to manage during all the years of Colonization and up to that period. He even befriended an Italian named Philip Mazzei, a Tuscan wine-maker, who he enlisted to help him. Despite all the years, effort, and enormous expense, Jefferson like all the others before him, never did manage to find a way to make decent wine in America. This entry was posted in Fun, Historical Stuff and tagged American wine, famous quote, Good wine, history, Italian Wine, Philip Mazzei, Thomas Jefferson, Tuscany, Wine, Wine History. Bookmark the permalink.